Saratoga Springs Acupuncturist Jonathon Kramer L.Ac. 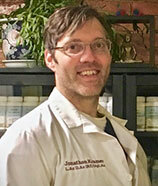 Jonathon Kramer, L.Ac., is a Board Certified and Licensed Acupuncturist in Saratoga Springs, NY. Jonathon Kramer is a native of Connecticut, growing up in Collinsville. He is a licensed acupuncturist and practitioner of Oriental Medicine in NY, CT and FL. He attended East West College of Natural Medicine studying closely under Dr. Zhu, a well known chief physician in Zhejiang Province, China. Jon received a bachelors degree in Health Sciences and a Masters Degree in Oriental Medicine. His studies included Classical and Chinese Medicine as well as Acupuncture Sports Medicine, Japanese Acupuncture and Homeopathy. Also Eastern and Western Botanicals Medicinals and Clinical Nutritional Supplementation. He continued his studies at Pacific College of Oriental Medicine in NYC with a background in orthopedic assessment and physical exam. Before Jon found his true calling in Oriental Medicine and healing, he received a bachelors degree in Criminal Justice at Marist College in NY. He is also proud to have served our country in the United States Coast Guard with Honors and was also awarded Commendation for excellence. His path then turned towards healing as he started his journey at the Arizona School of Massage Therapy in Tempe, receiving certification as a massage therapist. Today Jon works diligently and compassionately to help people live their lives to their utmost potential and well-being in mind, body and spirit.